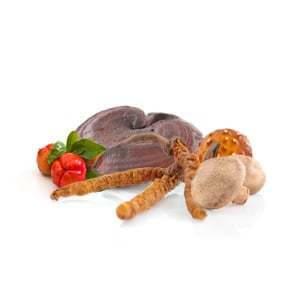 A broad combination of medicinal mushrooms cordyceps, reishi, shiitake and agaricus naturally supports the immune system.We have added vitamin C in the form of Acerola to enhance the effect. MycoComplex is a balanced combination of medicinal mushrooms Cordyceps (caterpillar fungus, Cordyceps sinensis), Reishi (lingzhi mushroom, ganoderma lucidum), Agaricus (Brazilian mushroom, Agaricus blazei Murill) and Shiitake (sawtooth oak mushroom, Lentinula edodes). We also added Acerola (Barbados cherry), which contains a high concentration of vitamin C. We have created it for full replenishment of forces and support of natural body defences and regulation of the immune system. The four used mushrooms act synergistically in the mixture, so their effect is multiplied. To boost the immune system, you can do a lot of it yourself, especially by adjusting your eating habits. See the specific procedures in this article - here. You can find more information at Mushroom Collection or in the section Effects. I started giving MycoComplex to my children in mid-August. Every year they were sick at school and kindergarten. So far they haven’t been ill for a month. They just have a bit of a moan about the sweets. We don‘t know of anything better for improving the immunity, and we tried different things. We also try to follow the dietary advice on the Mycomedica website ... I think it does a great job for the whole family. I was often sick, I caught almost everything I encounted. The district physician wasn’t best pleased with me, we solved weakened immunity, chlamydia, borrelia, treptococci ... From the beginning of June I started taking the recommendation of the combination of Coriolus and MycoComplex. Today I feel great, I could distribute energy. And all this time I haven’t been sick. I'll hold on until the winter starts, then I try to slowly and gradually discontinue. I'll still buy your excellent Cordyceps.